To celebrate its 10th anniversary, Cask Ale Week 2018 has been launched with a new look. The new logo for the ‘Week’ incorporates the shape of the cask end and a pump handle. Logo variations include black on white, white on black, greyscale and – doffing a hat to ‘brewed in Britain’ – red, white and blue. This gives flexibility to the many different participating pubs and breweries for their online and hard-copy marketing. Cask Marque director Paul Nunny, who runs the Week says the 10th birthday is a good time to evaluate and celebrate the contribution of cask to pubs and to the industry. “With the choice of food and drink venues increasing all the time, it’s crucial to promote what’s special about pubs. In my book, that means cask-conditioned beer. “The process of brewing cask ale is completed in the cellar, making it unique to pubs and different from other beers. Kept well and marketed properly, it drives footfall. “Cask contains no added gas, so readily falls into the ‘natural’ category. There’s a huge following for natural, unadulterated food and drink that is produced in the most environmentally-friendly way – and licensees looking to exploit that market should highlight how real ale fits into this category. 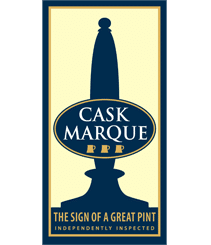 Cask Marque promotes Cask Ale Week through its Caskfinder App. There are 30,000 beer and pub explorers who use it to join in The World’s Biggest Ale Trail. Over the 10 days of Cask Ale Week their use increases by 65% – and incentive if ever there was one for pubs to get involved. It’s easy for pubs and breweries to join in. Decide what you’re going to do 20th – 30th September to celebrate your cask beers, download the logos from the Cask Ale Week website https://caskaleweek.co.uk/download-logos/, and let laura@redflamecommunications.co.uk know your plans for Cask Ale Week 2018.